You’ve done your research, talked to a breeder or shelter, and after taking the plunge, your perfect match was found and you are getting a puppy! Congratulations on expanding your family and your heart! Adding a dog to your life can be a very rewarding experience. However, if you’ve never had a dog before, you may not know what to buy for a new puppy before you can bring your new family member home. So, what do you need for a puppy? 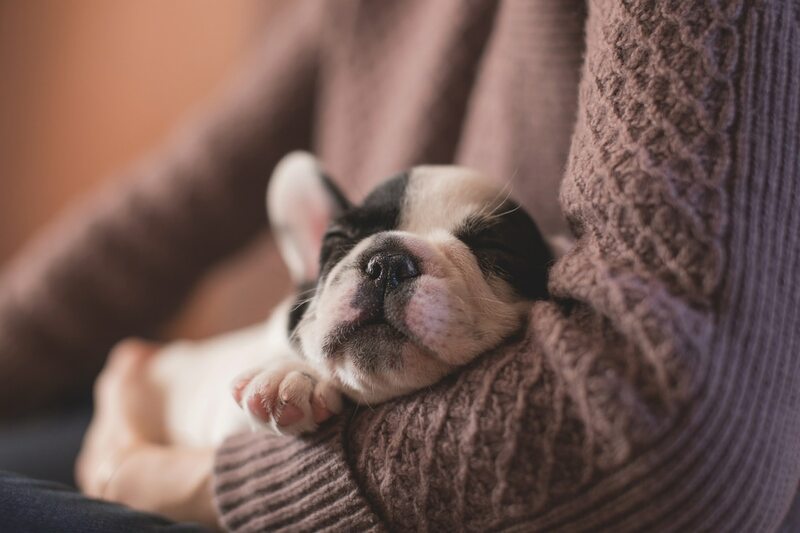 There are three important areas to consider: Items to purchase before bringing your puppy home, items to purchase after your puppy is settled in, and important lifelong services. Read on for a new puppy checklist and discover what you need to raise a happy, healthy dog. You’ve got a puppy on the way! 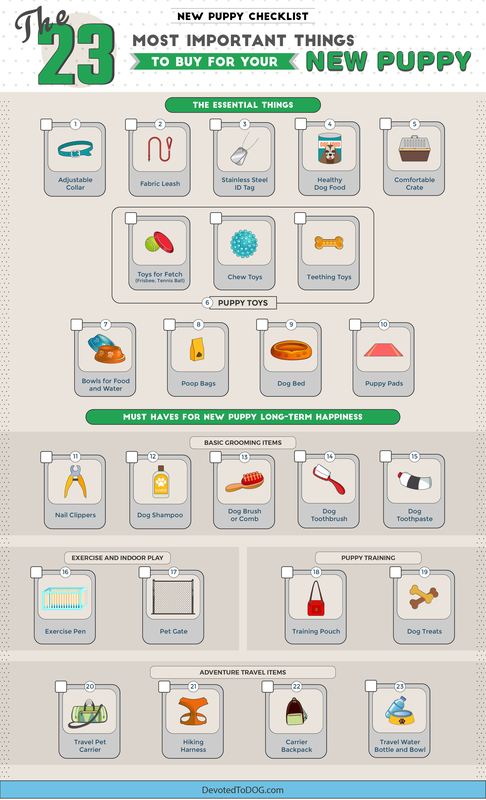 Before you bring your new puppy home, make sure you’ve got all the necessities lined up. Your new dog should wear a collar at all times. 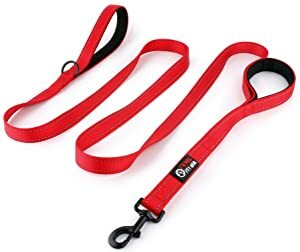 Collars are needed for walks; they also are easy to grab if your dog gets into a fight or needs to be removed from a situation for some reason. Most importantly, the collar is where you will attach an identification tag, which greatly increases the chances of your puppy being returned quickly if they ever get lost. When choosing a collar, make sure it is one that is adjustable, especially since your new puppy is still growing. You want the collar to fit snuggly but comfortably (the rule of thumb is to leave enough room for two fingers). 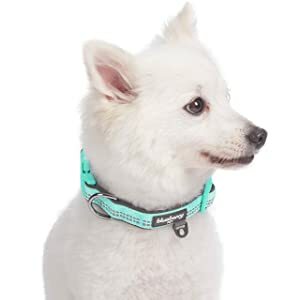 This Blueberry Pet Reflective Adjustable Collar is a great example of an adjustable collar that you can easily put on and take off but not have to re-adjust every time. It is also has reflective properties, which is an added safety feature at night. 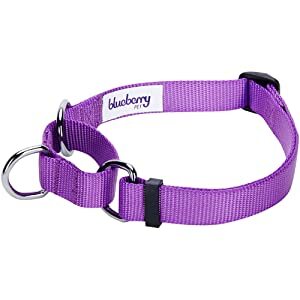 If your puppy knows how to slip out of a standard adjustable collar, consider using a martingale collar instead, like this Blueberry Pet Training Martingale Adjustable Collar. This type of collar tightens if they pull, making it more difficult for them to slip out of it. For safety reasons, your new puppy should be on a leash when outside of the home. You will only want to let your puppy wander off-leash in a designated area once they have bonded to you and have a strong recall. If your puppy is a small dog breed, a retractable leash might be a good option for you. A retractable leash will give you the flexibility to let your dog roam a bit further but quickly and easily pull them back when someone else approaches. This leash by Peteast is one of the best retractable dog leashes out there. Its ergonomic design does not get tangled and allows you to control the leash with one hand. Be careful not to drop a retractable leash when your puppy is attached; if your dog begins to walk away, the retractable leash will make loud noises as it drags on the ground which may startle your puppy. While retractable leashes may work for puppies and smaller dogs, they can be easily broken by larger dogs who pull hard. If your puppy is likely to grow up to be a larger dog, consider getting a standard leash instead. This leash by Primal Pet is an excellent example that gives your dog a six-foot range and allows you to easily and comfortably walk them in a heel position when training. Pick out an identification (ID) tag to attach to your dog’s collar in advance. This important addition will help reunite you with your puppy in the case of an emergency. You should include your up-to-date contact information on the tag, as well as the dog’s name. Most pet stores offer in-store help to pick out and design your ID tag. 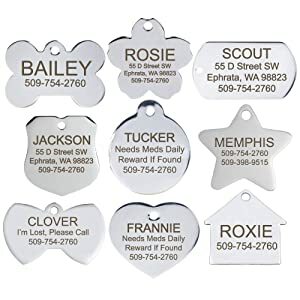 This simple Stainless Steel Pet ID Tag provides online personalization with an engraved front and back, and comes in a variety of shapes, including: Bone, Round, Heart, Flower, Shield, House, Star, Rectangle and Bow Tie. It is a stronger, more durable alternative to aluminum tags because it is much less prone to wear and tear. The laser engraving is clear and stands-out on the tag’s mirror finish, making it easy to read. Make sure your dog food is age-appropriate. Puppy-specific dog food contains the calories and nutrition needed while your puppy is growing. Determine the quality of the food by reading the food label. 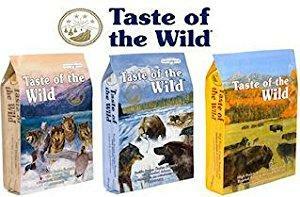 Taste of the Wild is a good example of high-quality food, as it contains a mixture of meats, vegetables and fruits — and all of these ingredients are at the top of the list. It also does not contain allergens such as grain or corn. Switching a dog’s food suddenly can cause diarrhea. To avoid this, find out what kind of food your puppy is currently eating; if you plan to switch to a different kind, see if you can bring some of the current food home to slowly mix in your puppy’s new food over a couple of weeks. If you are unable to get some of the current food, pick up a small bag at your local pet store. Canned pumpkin is good to have on hand to help firm up loose stools that can occur from switching food too quickly; the rule of thumb is one tablespoon for every 10 pounds. Canned pure pumpkin can be found by the pie ingredients in your local grocery store (make sure “Pumpkin” is the only ingredient listed otherwise you likely have pie filling which will have the opposite effect). Some people associate crates as punishment, but when done correctly, crates are a very positive experience for dogs. Crate training is instrumental in keeping your puppy safe when you are not home and also helps tremendously with housebreaking. Crates should rarely be used for punishment, unless it is for a quick timeout like you might send a child to their room. Crates also help keep your dog safe when travelling by keeping your puppy away from the driver. The crate should be large enough for your dog to stand, lay down, turn and stretch. This 2PET dog crate is a safe option for car travel and for short, overnight trips. 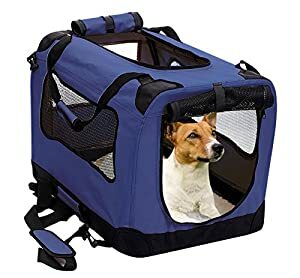 Its creative design allows for easy, quick folding and unfolding while you are on the go, and it includes a top handle to convert it into a fully-functional pet carrier. The carrier is designed with good air ventilation in mind for your puppy and comes with a waterproof mat and a reversible, washable fleece cushion pad. 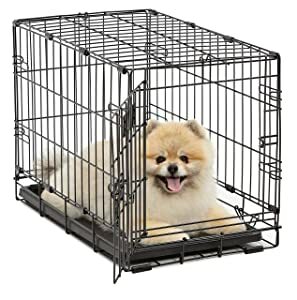 If your puppy is likely going to be a larger dog, consider a metal crate with a movable divider. This MidWest crate is a sturdy example with a divider that can be adjusted to meet your puppy’s changing size. Consider adding a crate pad to make your puppy feel even more cozy. 6 Dog Crate Types – Which one is best for your dog? How do you pick the perfect puppy toys? By choosing a bunch of options for your new puppy to help him or her feel right at home! Include some chewing and teething toys to help teach your puppy the appropriate ways and items to chew (instead of your shoes! ), balls and other fetch toys to help burn off energy, and stuffed toys to play with together. 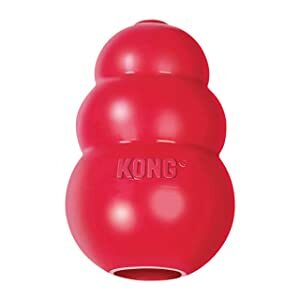 Many pet owners chose Kongs, which come in puppy size and can be filled with many different treats to keep your puppy occupied. 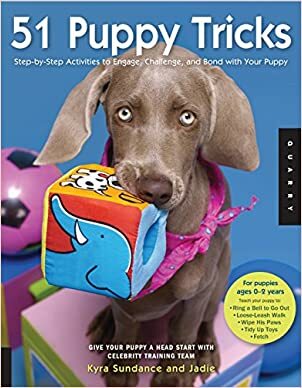 Another option, puppy heartbeat toys, mimic the sound of a dog mom’s heartbeat and can help puppies learn to sleep on their own in their crate at night and when you are away. These are great for helping to crate-train your puppy! 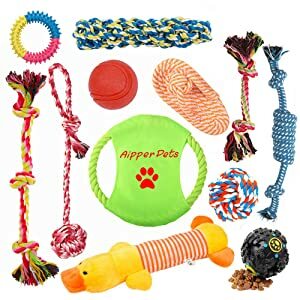 Consider starting with a Aipper Dog Puppy Toys 12 Pack, which includes colorful, durable and interactive toys to engage your new friend. Teething and chewing toys will help keep his teeth busy, while a rubber ball and squeaky toys will help engage his fetch instincts. This fun toy pack is sure to bring hours of entertainment and exercise for both you and your new best friend! Plastic bowls are too easy for your puppy to chew and destroy; ceramic bowls are easy to drop and break. 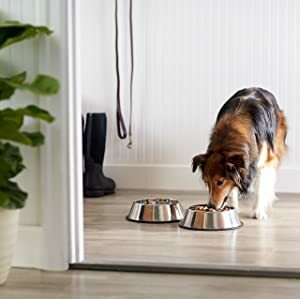 Stainless steel bowls, like this one by AmazonBasics, are durable and can take whatever you or your puppy throw at them. 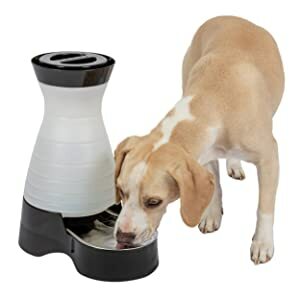 To keep your puppy hydrated throughout the day, you can consider using an automatic water dispenser by PetSafe. Try Earth Rated bags for an earth friendly, scented option. These durable bags are lavender-scented and fit into most poop roll dispensers for easy carrying. 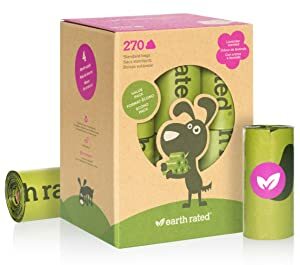 They are an environmentally conscious alternative, with the bag roll cores and packaging made from recycled materials. A dog bed gives your puppy a place to lay down and sleep and is especially needed if you will not allow your dog on furniture. Find one that is soft, waterproof and large enough for your puppy to grow into, like this one by PetFusion. Memory foam is a bonus for comfort! Consider buying an instructive dog bed to prevent your new puppy from developing bad bed chewing habits. While letting your dog out regularly is the best way to potty train them, that’s not always feasible for a puppy who cannot hold his or her bladder for a full day at work. Puppy pads are key for keeping the mess off your floors. 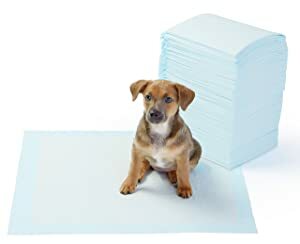 These puppy pads from AmazonBasics jellify liquids on contact and are leak proof. After a month of settling in, consider what to get for a new puppy to keep yours safe, well exercised, healthy and happy for the long-term. To keep your dog healthy, you’ll want to add basic grooming into your regular schedule. Long nails can cause a lot of foot pain, and some nails can actually start to painfully grow into their pads. Ask your veterinarian or groomer to show you how to trim. Play with your puppy’s paws often and trim their nails at an early age to desensitize them. 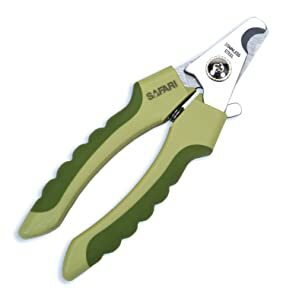 This Safari clipper is a great example of a trimmer — it functions like a scissors making it less likely to catch the nail if your puppy moves. 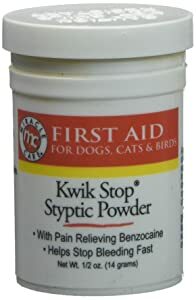 Keep Qwik Stop Styptic Powder on hand in case you hit the quick; this powder clots blood and has some pain reliever in it (if you do not have Qwik Stop on hand, common household flour is also useful to clot). If you accidentally hit the quick, remain calm and act like nothing happened; hitting the quick usually is not painful and your puppy will feed off of and learn from your reaction. Give your dog regular baths. A dirty coat can cause skin irritations and make your dog more prone to infections. However, make sure you do not wash your puppy too frequently, otherwise natural oils wash away and dry out the skin. Oatmeal does wonders to calm irritated skin. There are also shampoos to help with shed control. When washing, make sure you follow the instructions on the bottle and avoid getting any in your puppy’s eyes. 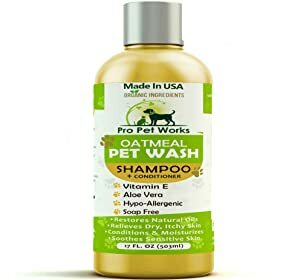 This shampoo/conditioner from Pro Pet Works is gentle, hypoallergenic and contains oatmeal, so it will help clean your puppy while keeping their skin hydrated. In addition to baths, you should brush your puppy’s fur regularly. Brushing keeps your dog’s coat healthy by removing mats, dirt and dander. Brushing also helps reduce the amount of fur you need to vacuum or sweep up around the house. Your dog may have seasonal “blowouts,” where it sheds a lot preparing for winter or summer, and brushing will help tremendously during this time. 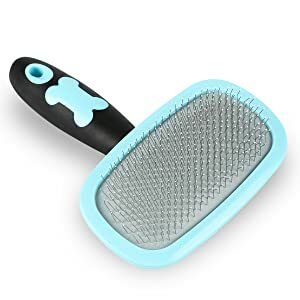 This Glendan brush is a great option for regular brushing. A healthy mouth is very important — poor teeth are directly related to heart, liver, and kidney problems. Work regular brushings into your puppy’s routine as early as possible. This Nylabone dental kit comes with a toothbrush and toothpaste and is designed specifically for puppies. Puppies have a lot of energy. Daily walks with a gradual increase of length are a good way to burn some of this energy, and you might get the added bonus of socializing with other people and dogs. Running can impact joint and muscle development, so check with your veterinarian first before taking your new puppy for a run. Your puppy will want to play, so using toys you have at home is a great way to exercise them! 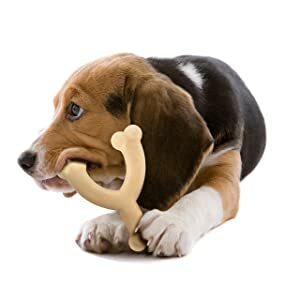 You can also buy teething toys, like this Nylabone, to help satisfy his or her chewing tendencies. 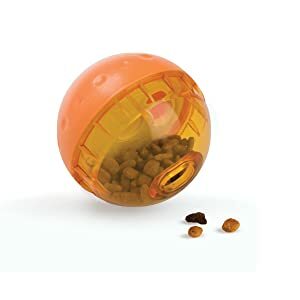 If your puppy is highly food motivated, putting some treats or part of a meal in a treat-dispensing toy, like this one by OurPets IQ, can help mentally stimulate them while satisfying their play instincts. 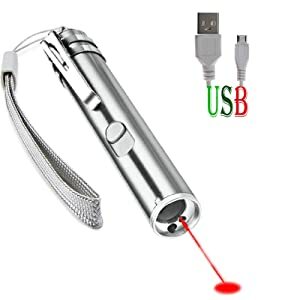 You might also be able to get your puppy to chase a laser pointer, like this one by JJYPet. 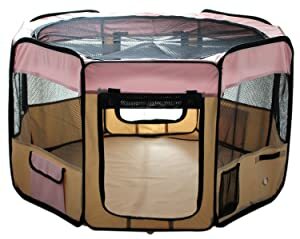 A playpen gives your new puppy room to play indoors without having to worry about them getting into something they shouldn’t. This playpen by Esk Collection is roomy, easy to set-up and take down, waterproof and doesn’t take up much room for storage. 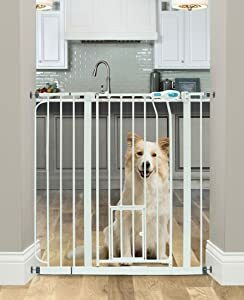 As your puppy outgrows their playpen, you can set up a baby gate to keep him or her contained to a puppy-proof room they can explore. This walkthrough gate by Carlson is set up easily using a pressure mount system and allows you to walk through without having to take the whole gate down. 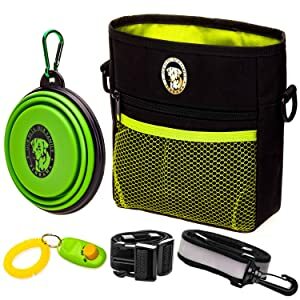 Dog Treat Bag, include Clicker, Collapsible Food Bowl, Waist & Shoulder Reflective Straps and Belt Clip. Training Guide: This 51 Puppy Tricks with fun, colorful photos makes it easy to train and bond with your new friend. It has all the tools you need to teach your puppy important good behaviors and fun, new tricks and to help development his mind and body. 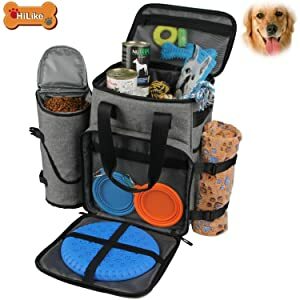 Training Pouch: You also might want to consider a training set that has everything you need to start training your puppy. Training Treats: Puppy treats will play an important role in helping you bond with and train your dog. Just like puppy food, puppy treats are designed specifically for young dogs. They are smaller, easier to chew and have the right mix of nutrients needed to keep your puppy healthy. In addition, training treats are bite sized and designed to help you train your new pet with positive reinforcement of good behaviors. 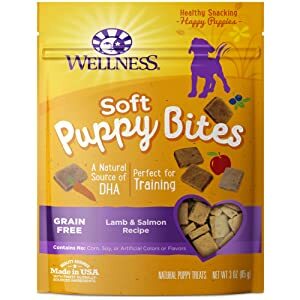 One safe and tasty option your puppy is sure to love is Wellness Natural Grain Free Puppy Training Treats. These are great for both treating and training your puppy, because these treats are soft, chewy and perfectly-sized for small mouths. Your new friend is sure to do backflips for these scrumptious and healthy treats! Are you planning to go on adventures together, hiking or traveling with your new friend? 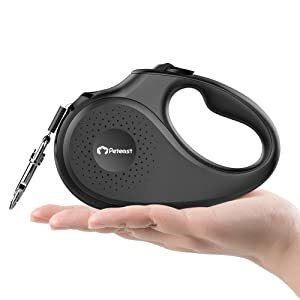 There are many pet travel accessories available to make your trip a little easier, safer and fun for your furry friend. Consider a smaller travel crate to start (read the airline travel crate rules carefully if you plan to fly with your puppy). In addition, you might want to purchase a hiking harness as a safe, comfortable alterative to your every-day collar to prepare for adventure hikes with your dog. 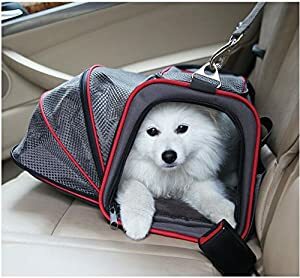 This Airline Approved Pet Carrier by Pet Peppy is suitable for car or plane rides. Its unique roof ventilation design offers your puppy supreme comfort and increased air circulation. It is perfectly designed to fit easily under an airplane cabin seat for safe air travel. It is also crafted from lightweight, durable material and offers double zippers for entry/exit on both sides. 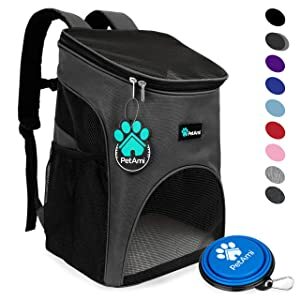 For adventurous pet owners, the PetAmi Pet Carrier Backpack for small dogs is designed for hiking. It comes in 9 sharp colors so you and your pup can travel in style. The backpack offers both waist and chest buckles to give you extra support, and a safety strap to ensure your puppy can’t escape. 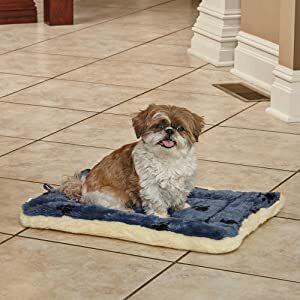 It also has an air-ventilation design to ensure good airflow for your puppy, as well as a comfortable Sherpa-lined bed and a collapsible water bowl. Choosing the right veterinarian is important. If you don’t already have a family veterinarian, ask your friends and colleagues for recommendations, or do research online to find one. Bringing your dog in for a puppy wellness check-up is an important first step in raising a healthy dog. Most puppies will need additional shots throughout the first year of your life. You should also research emergency veterinarian services now, before an emergency occurs, and save the information in a handy location. Enroll your puppy in puppy training or puppy kindergarten classes as soon as possible. Some training centers offer puppy classes on weekends and in the evening for free, because it’s important to socialize your puppy with other dogs in a safe environment starting when they are very young. Puppies can begin training classes very soon as well, to help them learn safe and appropriate behaviors. Research what options are available in your neighborhood! Many dog owners use dog walking services to help raise their puppy during the work week when they have to be away from home. There are local dog walking services available in most cities, or you can ask a friend, relative or neighbor to help. Most puppies need to be taken out 2-3 times during the workday, so make sure you research dog walking options before bringing your new puppy home. Some dog walkers use phone apps that allow you to track your puppy’s walk and share photos and information with you throughout the day. A pet camera is another option to help ease your piece of mind when you are away during the day. Some allow you to talk and interact with your pet! In addition to puppy training, it’s important to research puppy daycare and overnight boarding options before you need them the first time. Most require a “dog interview” before you leave your puppy for the first time, so it’s best to plan in advance. Do online research and visit the daycare/boarding facility in advance to ensure you pick a safe, healthy environment for your puppy to visit. Puppies have a lot of energy and need a lot of exercise. It’s best to research local dog parks and walking/hiking spots so you have a list of options of where to take your new best friend, to work off some of that puppy energy. Talk to your veterinarian and puppy trainer about what age they recommend your puppy is before he or she visits a dog park for the first time. But, you can visit a human park and hiking trails as soon as you are ready for your first leashed-up adventure! Congratulations on bringing home a new furry friend, who is sure to make a great addition to your family. Puppies provide a wealth of love, affection and fun but they are also a lot of work and take energy, enthusiasm and training to raise. Hopefully, this list of items and services you can research and purchase in advance will help make your transition an easy one, so you can focus on what’s most important in raising a happy, healthy puppy – love!